A renters insurance policy covers the valuable personal items, of a tenant, if they get destroyed in a natural disaster or are stolen. A renters insurance policy covers the valuable personal items, of a tenant, if they get destroyed in a natural disaster or are stolen. It can also offer liability coverage by providing protection for medical expenses for the people living in that property. There are certain myths regarding a renters insurance policy. You can clear your misconceptions regarding renters insurance by going through this article. Reality: All insurance policies are complicated in the sense that you need to go through the policy terms and conditions and buy the required coverage. However, there are some easy way outs to follow. Select a higher deductible to lower the premium cost, if you are financially capable to pay the deductible if needs arise. You also need to know the difference between RVC (Replacement Value Coverage) and AVC (Actual Value Coverage). If you choose RVC, you get the necessary money to buy a similar item whereas, if you go for AVC, you get the depreciated value of the insured stuff. You will have to pay little more on premium if you choose RVC over AVC. And, most importantly, your premium will be more if you live in a crime-prone locality. However, you can still reduce the cost by installing a home alarm and other necessary anti-theft devices. And, lastly, shop around to find a suitable policy with the required coverage at a comparatively lower rate. Reality: Not all policies cover roommates; so, you need to be sure whether or not you're covered under that policy. Even if you're covered, check out how much coverage your roommate has and calculate whether or not your stuff is more expensive. If yes, then you need to have a separate policy. 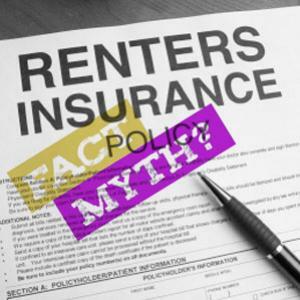 Reality: This is one of the common myths related to a renters insurance policy. But, think for a moment. The building might be covered under your landlord's policy but how will your stuffs be covered under the same policy? You need a separate policy to cover your valuable personal items. Reality: You might not have expensive items at your home but think for a moment - how much your television, furniture and other gadgets are worth of. Will you be able to shell out the required dollars if they get destroyed or are stolen? There are several websites where you can check out how much your stuffs are worth of. This will help you get the required coverage. Apart from the above 4 myths, another common myth (Myth 5) is that renters insurance is expensive like homeowners' insurance. However, in reality, it's not. Researches reveal that one has to spend about $12 per month for a suitable renters insurance policy. Moreover, you can reduce the cost of the individual policy by buying multiple insurance policies from the same insurer. By doing so, you'll get multiple policy discounts and the sum total premium cost of your policies will reduce to some extent, thus helping you in planning your monthly and annual budget of your household.